Kraft shopping bags size 8x4.75x10.5". 100g basis weight kraft paper with a serrated top edge. MATERIAL: These Red Dots paper bags are made of 40% PCW Recycle Paper. FSC compliant. ECO-Friendly: Our paper bags with perfect glued are BIO-DEGRADABLE and RECYCLABLE with no peculiar smell and non-poisonous. Look a lot classier than giving customers those white plastic t-shirt style bags. PREMIUM QUALITY. Holding up to 6lbs, all bags with paper twist handles are well constructed. No stray glue any where and the solid bottoms can make it stand alone easily. 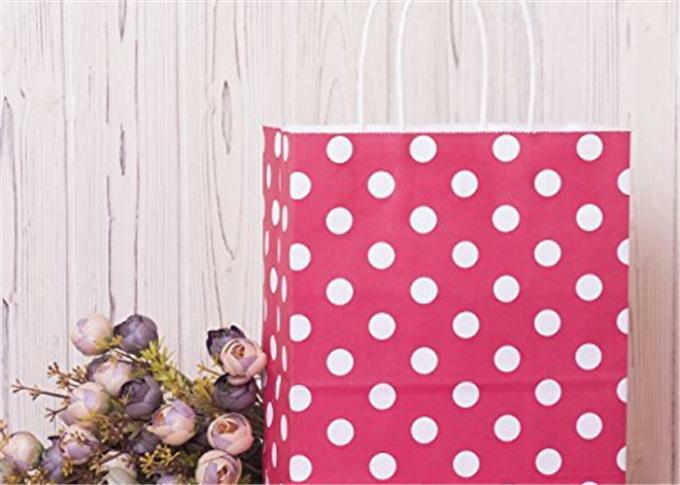 MULTIPLE USES: These Red Dots kraft paper bags are wonderful medium size for any number of things. Great for shopping bags, gift bags, kraft bags, retail bags, mechandise bags and standard paper bags. • Our kraft shopping bags are glossy paper which make them a little more elegant looking than the plastic which tend to tear easily. • The retail paper bags are perfect size and work beautifully for your business. At this price, they are nice to be able to place product in such an elegant handy bag for your customers. On the other hand, you could print your own labels/logo stamp and put them on each bag, made the shopping bags on behalf of your store. 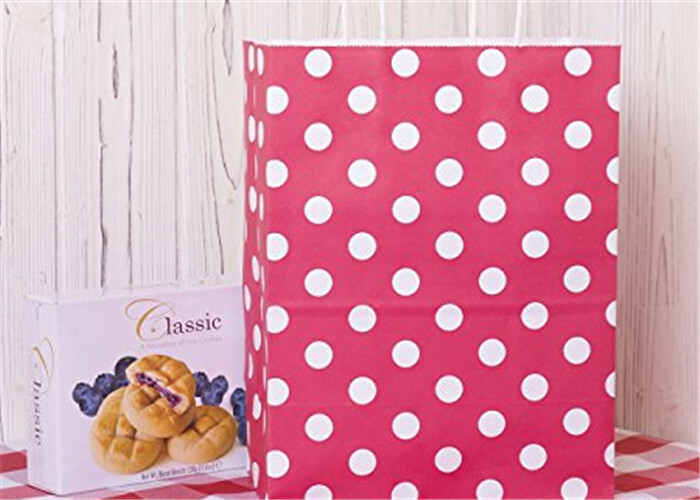 • Different from the blank kraft bags, customers would be impressed by these fashion Red Dots paper bags. The unique design make them suprise. They are perfect as shopping bags, gift bags and also good for wedding. ☑Bags Material: 100g basis weight. Made of 40% PCW Recycle Paper with a serrated top edge.